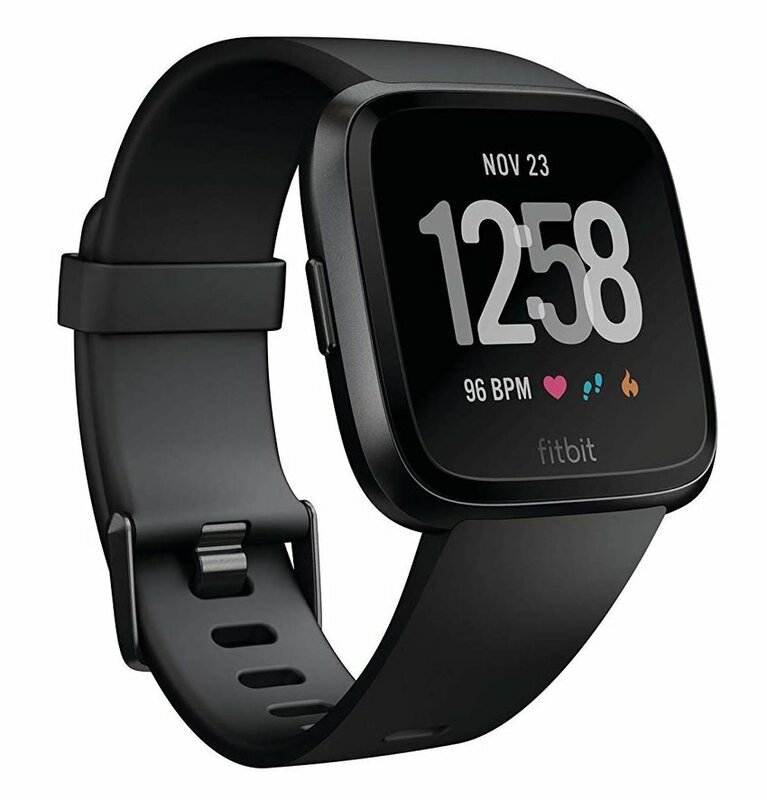 For the health-conscious female traveler, a Fitbit Versa electronic watch ticks all the critical boxes for a fitness fanatic - and then some. Versa, the self-proclaimed “fitness companion”, monitors your activity, exercise, sleep, and weight. It’s also water-resistant to up to 50 meters, so no worries about taking it swimming, surfing, paddle boarding, or even scuba diving. Versa can also be personalized to any look or occasion. You can choose from a variety of colored straps made from leather, stainless steel, or the classic swim-ready, sweat-proof rubber material. It’s also compatible with iPhones, Androids, and Windows phones. With all these features, staying fit while on the road has never been easier. Bonus: The battery life lasts for up to 4 days, allowing it to withstand long-haul flights and overnight buses. For the environmentally-friendly travel girl who’s often off exploring nature or out-of-the-way places, a water bottle and filter combination is a sensible choice. She can fill her bottle from a river, stream, lake, or faucet without worrying about whether the water is safe to drink or not. The built-in purifying system takes care of the hassle. There are plenty of options, but we like LifeStraw for its attractive design and its charitable mission. For every LifeStraw purchase, one child somewhere in the world receives a year’s worth of clean drinking water. No matter how seasoned a traveler she is, there are always many “things” that need to stay close to her during a trip. That’s why a carry-on approved sized tote bag is a great gift. A spacious canvas tote is easy to clean, can hold many important travel items (tablet, book, cosmetics bag, shawl, smaller purse, etc. ), and can fold up into a thin square when not being used. We like Longchamp Le Pliage and Lo & Sons for their practical design. 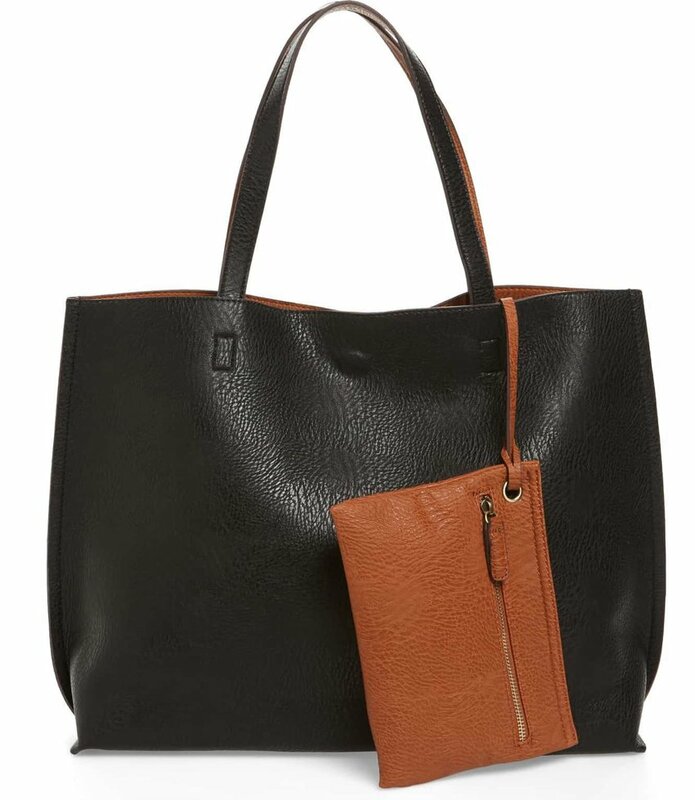 For the fashionista traveler who’s also an animal lover, check out this $50 steal from Street Level – attractive design, easy on the wallet, and made from all vegan materials! Who doesn’t love watching the sun go down with a glass of wine in their hand while soaking up all the beauty of a new destination? If you know a travel-happy gal who loves wine, then gifting her this foldable wine flask will make her holiday season (and her next trip) brighter. The Wine2Go bottle is unbreakable, collapsible, flexible, reusable, and holds a standard-size bottle of wine (750ml). Ideal for camping trips, beach lounging at sunset, and music festivals. Just give it a quick rinse once the wine is finished and fold it up and store it for next time. Bonus: It’s much lighter than lugging around the glass bottled version! A two-in-one passport holder and wallet simplifies traveling by keeping all the important things like cash, cards, and passport in one place. There’s a lot of different options out there, so check out Etsy for some truly original designs. 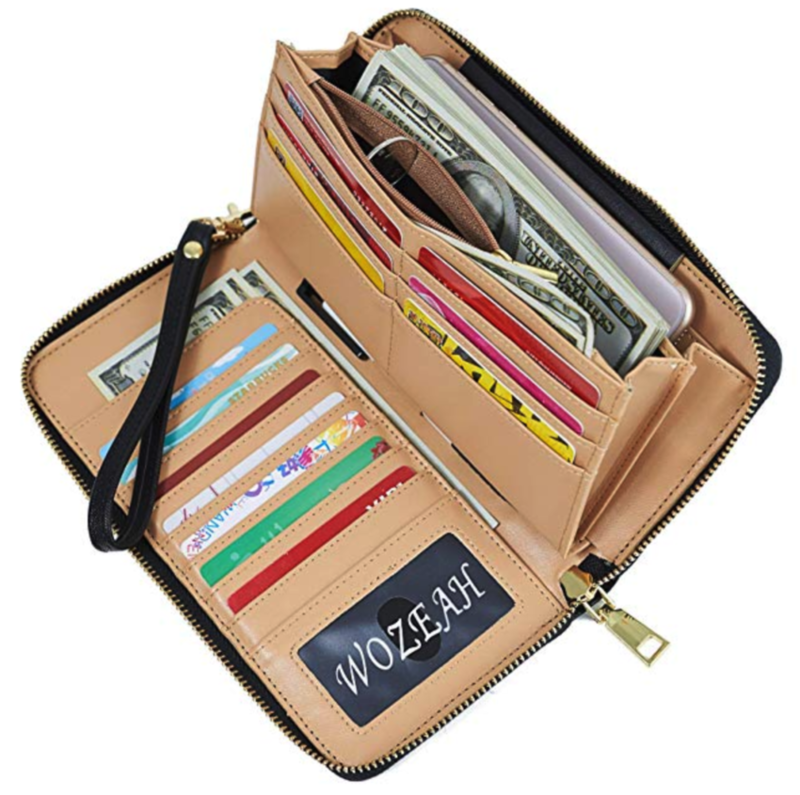 We also love the spaciousness, versatility, and color options of WOZEAH’s travel clutch. They’ve thought of everything from multiple different zips pouches to keep international currencies separate, to a pen loop, to a removable wrist strap. It’s even roomie enough to fit her smartphone inside! Bonus: There’s also a 100% money-back guarantee – if anything happens to this wallet, they’ll replace it. 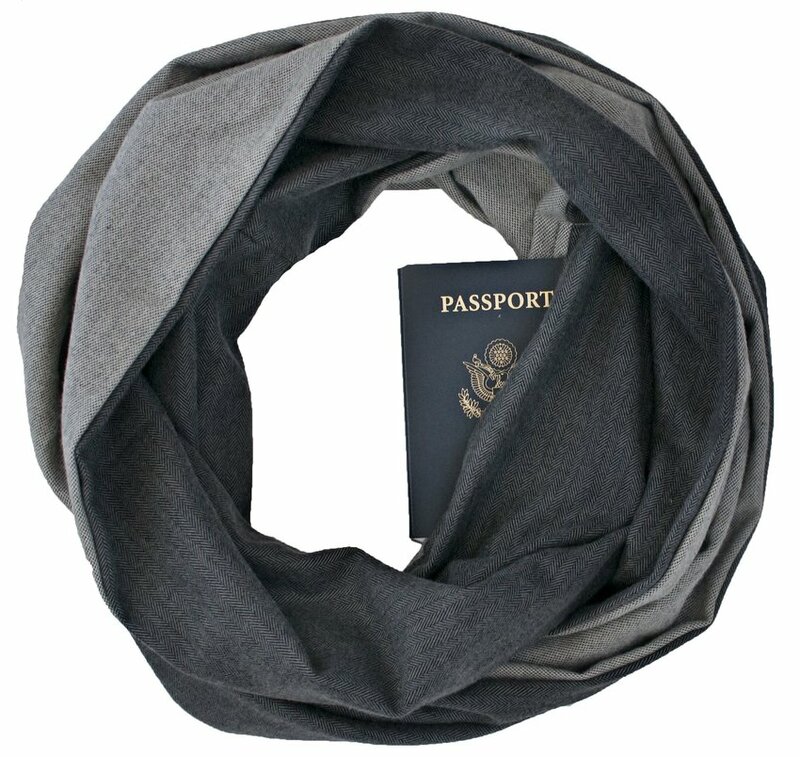 Any globe-trotting female knows a shawl or scarf is a staple item to have when traveling. They’ll also tell you how clutch it is to have one travel item double as another. Enter: the infinity zipper scarf. She knows the infinity scarf already as a large loop of comfy fabric she can wrap around her neck to stay warm, look cool, and keep her cozy on the go. Now add in a secret zip pocket that can hold cash, credit cards, a cell phone, passport, or any other important travel item that needs protecting. We love the pattern varieties of Speakeasy Travel Supply’s Secret Pocket Travel Scarves. Know a girl who never misses the chances at a warm-weather vacation? Give the ultimate gift of choice when it comes to her foot attire with a pair of these sandals that come with three choices of strap colors and patterns. Now there’s no need to pack multiple pairs of flip flops and sandals; the Cambiami Interchangeable Sandal sets come with one pair of soles and three swappable straps, letting every lady personalize her own footwear on the road. From cork soles to vegan black bottoms, pick the sole style and color then pick the strap pack that best suits your beach-bound buddy! If you think hair products are too simple a gift for a world traveler, then you probably haven’t experienced Lush. This all-natural company hand makes every single one of their products and the result is absolutely divine. Who says you can smell, look, and feel good while you’re backpacking the world? 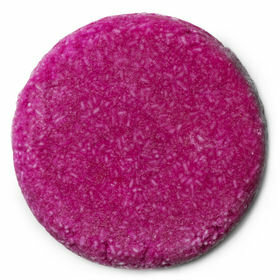 Lush’s shampoo and condition bars are a practical and pampering gift for any female traveler. The bars lather better than liquid shampoo, last for up to 80 washes, and are scented with essential oils and fresh ingredients like fair trade honey, organic oranges, and lemon juice. Not only do they smell good enough to eat, they’re a breeze going through airport security.